With sharp knife slit the rows of kernels down the length of the ears of corn. Use the back of the knife in a downward scraping motion to remove pulp. You should have about 2 cups. In a large bowl, combine corn and flour. Beat in eggs and seasonings. In a saucepan, melt butter in milk over medium heat. Whisk hot milk into corn mixture. Pour mixture into a buttered 2-quart baking dish. Place dish in a pan of hot water and bake 50-60 minutes, until custard has set. 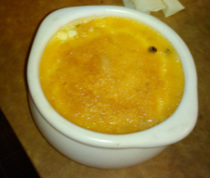 Personal/Team: Really flavorful, similar to the corn custard made earlier int he quarter. It seemed watery on the bottom. I think this would have been great if we had added some chilies to it. Lessons Learned: Cooking any sort of custard, should use a waterbath to gently cook and not overcook It's OK if there is water in the bottom of the dish, you would just serve with a slotted spoon to drain the water and keep the good parts.